- a turpentine clean-up, solvent-based, single pack renowned quality curing compound and same day 'sealer' coating product for all cast-inplace concrete, wall rendering mortar and similar cement bound surfaces, be applied in a minimum total of 2 coats. The first coat of Duro-Seel Clear should be applied as a curing compound* almost immediately after or if it can be applied without damaging the freshly placed wet ‘plastic’ concrete a little before it has set (usually within 2-3 hours of placing the concrete or applying the mortar - on the same day - the actual time is dependant on the weather). For lasting results the essential second coat to completely seal the concrete should preferably be applied any time after the concrete has sufficiently hardened and the first (curing compound) coat has dried fully (approximately 1 to 3 days - depending on the weather). If the concrete is existing concrete - ie. has set and hardened and is at least 24 hours old in summer and up to 4 days old in winter (after mixing, placing, finishing and setting) - the user prior to the coating operation should firstly prepare the surface to be coated by removing all contaminants such as dirt, oil, grease, old failed existing coatings, chewing gum etc. 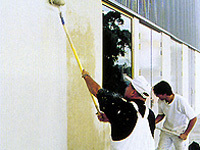 The user must then also before applying Duro-Seel Clear effectively to be coated to remove laitance (a concrete surface layer of weak cement ‘scum’), efflorescence (white ‘salty’ bloom) and any other weak, soft (often dusty) surface material from the existing concrete to result in a sound, firm, strong, clean and dry surface. 3. acid etching / neutralising / drying. * A curing compound is a coating which dries and hardens to have very low moisture transmission rates and is designed to keep the water used to mix concrete or mortar from evaporating. The procedure of curing concrete / mortar by keeping the original mix water in for a period of a month ensures their ideal strength development and durability. ** Existing fully hardened cast-in-place concrete (and other suitable firm strong and uncontaminated cement bound surfaces) to be coated with Ability coatings must be free of all contaminants, such as oil, grease, chewing gum, other ‘gunk’, dirt, verdigris, old coatings and concrete ‘sealers’ and be in a dry condition - prior to acid etching. NB: Chewing gum may be removed by first freezing with CO2 gas and then scraping it off. Acid etching is a laborious, but one of the lowest and most cost effective methods for removing weak surface laitance. Please - Take great care! Firstly, always use protective clothing, gloves, eye, and foot protection when using dangerous acid(s). Carefully make a mixture of one (1) part by volume of Spirits of Salts (33% Hydrochloric Acid, which is also called Muriatic Acid) by carefully adding it to three (3) parts by volume of water. These liquids are carefully mixed in a plastic (not metal) garden watering container and then sprayed from this container over all of the concrete surface intended to be treated with Duro-Seel Clear, and other Ability paving, floor, wall and roof coatings for concrete, mortar and other cement bound surfaces. Immediately a properly and protectively clothed second operator following the first application operator should carefully scrub this acid/water mixture into the surface well with a stiff broom and leave it on the concrete for at least 20 minutes to react with semi-hardened cement glue in the concrete to remove the weak surface layer of laitance. The 'spent' acid water mixture should then be neutralised with another different mixture consisting of 1 part household cloudy ammonia added to 3 parts water by volume, mixed in the same or similar plastic garden watering container, and then applied over all of the surface to which the acid / water mixture has been applied. This neutralising ammonia / water mixture is then effectively diluted, made safe and hosed away with plenty of clean tap water or all of it mopped up using an absorbent mop using plenty of clean tap water and several ‘moppings’. Walls, and other non-horizontal vertical surfaces made of concrete or other Portland cement bound surfaces to be coated with Duro-Seel Clear etc. can be prepared in this same way - preferably by a professional brick-cleaning contractor. Following this acid etching procedure, allow the surface to dry well, than carefully and liberally apply the first coat of Duro-Seel Clear or other Ability paint / coating as selected. Please read and study printed information available about the particular Ability coating before its use. For maintenance-free durability, a second coat of Duro-Seel Clear etc may be applied as soon as the first coat has fully dried and hardened (usually, 1-3 days later - depending on the weather). such as with a suitable large brush, medium pile roller or suitable spray equipment. Many professional applicators use a suitable soft broom - to act like a large paintbrush, which is considered by many of them to be one of the best methods. 1. Do not allow cars or other motor vehicles to remain stationary (parked) on the newly applied Duro-Seel Clear coated surface until the second coat of Duro-Seel Clear has fully dried and hardened (usually approximately 5 - 7 days or longer, depending on the weather). 2. The UV resistance and life expectancy of all organic resin based clear transparent coatings used in exterior applications is fairly limited - including clear Duro-Seel Clear, - much less than mineral oxide pigmented coloured coatings - such as Ability's coloured Dy-On-Crete® Mark 2 which has been coloured with Ability’s colourfast abilox® ultrafine particle mineral oxide pigments. Therefore, from a long-lasting durability point of view it is often preferable instead of the second (2nd) coat of Duro-Seel Clear coating to use one of coloured Dy-On-Crete® Mark 2 colours which incorporates fine UV resisting and absorbing abilox® mineral oxide colouring pigments. The ultra, ultra-tiny particulate colouring pigment particles protect transparent binders from degrading / destructive UV radiation to ensure the coating’s longevity. Dy-On-Crete® Mark 2 is available in twelve (12) standard colours. These are White, Sandstone, Yellow Oxide, Copperfield, Drovers Hat, Terra Cotta, Red Cliffs, Concrete Grey, Stormy Sea, Gunmetal, Charcoal and Black. 1. Remember to request a sample pot of Duro-Seel Clear and to use this to test and evaluate the product to completely determine its suitability for your use before you buy and use it. 2. The product should be completely tested by the applicator to the satisfaction of the architect, landscape architect, other specifier, purchaser, applicator and owner before buying the product. 3. Please note that on a scale of 100 units representing the degree of enduring durability and lasting nature of any paint/coating system, a single (1) coat application represents about 27 units, a two (2) coat system will be about 72 units, whereas a three (3) coat system will be represented by about 92 units! 4. The thicker the dry film thickness (dft) of a paint / surface coating - especially in an exterior environment - built up as a multi-coat system, the longer it will last without costly maintenance. It therefore pays to apply at least two (2) coats of Ability’s paints and surface coatings. For any further information you may need before using any of the Ability coating products please contact us via email or by calling our Melbourne Head office on: 61 3 9457 6488.